Formerly host to the 2014 Olympic Winter Games and the 2018 FIFA World Cup, Sochi is nestled in the slopes of the Caucasus Mountains and stretches 90 miles (145km) along the coast of the Black Sea, making it the longest city in Europe. Referred to as the 'Russian Riviera', Sochi boasts an inviting subtropical climate, pebbled beaches, lush forests, botanical parks, waterfalls, the UNESCO World Heritage Site of the Caucasian Biosphere Reserve, and a world-class skiing resort close by. Famed for its sulphur springs and myriad health spas, including the world-renowned Matsesta district. 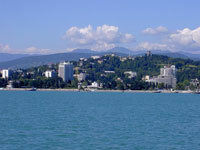 However, Sochi is more than just a healthy holiday destination: every summer the elite of Russia descend upon Sochi for the annual film festival while tourists flood in to enjoy the beaches, and during the winter Sochi sees a slew of travellers making their way to the nearby ski resorts, particularly Krasnaya Polyana. Home of tennis ace Maria Sharapova and Stalin's favourite holiday retreat, the city of Sochi offers visitors great skiing, hiking, and sailing opportunities. Any trip here will be a memorable and relaxing one.